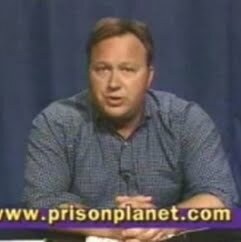 Alexander Emerick "Alex" Jones is an American conspiracy theorist, radio show host, documentary filmmaker, and writer. His syndicated news/talk show The Alex Jones Show, based in Austin, Texas, airs via the Genesis Communications Network and shortwave station WWCR across the United States, and on the Internet in video form. Jones has been the center of many controversies, including his controversial statements about gun control in the wake of the Sandy Hook Elementary School shooting. He has accused the US government of being involved in the Oklahoma City bombing, the September 11 attacks and the filming of fake Moon landings to hide NASA's secret technology. He believes that government and big business have colluded to create a New World Order through "manufactured economic crises, sophisticated surveillance tech and—above all—inside-job terror attacks that fuel exploitable hysteria". Jones describes himself as a libertarian and a paleoconservative. New York magazine described Jones as "America's leading conspiracy theorist", and the Southern Poverty Law Center describes him as "the most prolific conspiracy theorist in contemporary America."